Commander: "Those who have served and those currently serving the uniformed services of the United States are ever mindful that the sweetness of enduring peace has always been tainted by the bitterness of personal sacrifice." Vice Commander: "We are compelled to never forget that, while we enjoy our daily pleasures, there are others who have endured and may still be enduring the agonies of pain and internment." Commander: "Tonight we have honored guests who can not be with us so we remember them in this way." Vice Commander: "They are unable to be with their loved ones and families." Commander: "We call your attention to this small table, which occupies a place of dignity and honor. 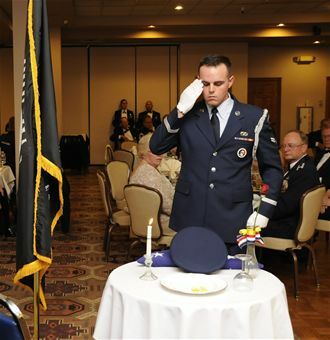 It is reserved to honor our missing loved ones and missing comrades in arms." Commander: "Please rise and uncover!" Commander: "The Sgt-at-Arms will advance to light the candle." 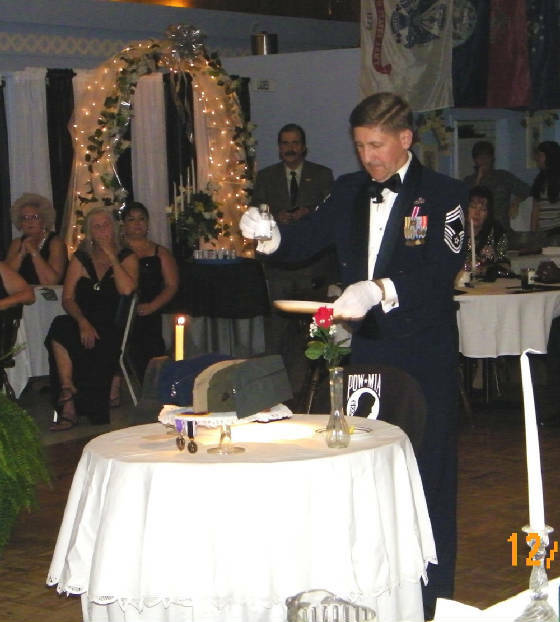 Commander: "The Sgt-at-Arms lighting the candle is a reminder for all of us to spare no effort to secure the release of any American prisoners from captivity, the repatriation of the remains of those who died bravely in defense of liberty, and a full accounting of those missing in action. " Commander: "Please be seated. I will explain the symbolism of each item." 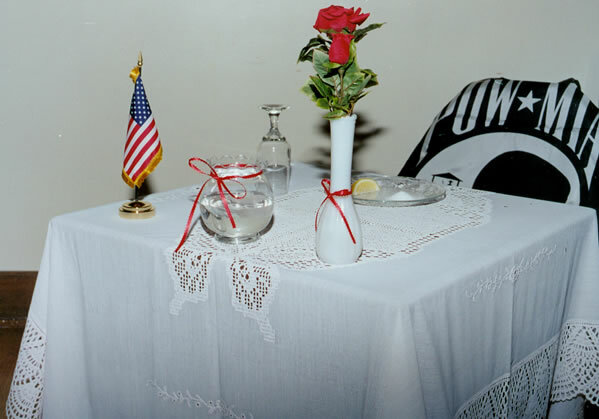 Commander: "This table, set for one, is small symbolizing the helplessness of one person alone against their oppressor. The table is round to show our everlasting concern for these missing men and women." Commander: "The table cloth is white, symbolizing the purity of their intentions to respond to their country's call to arms." Vice Commander: "The Bread Plate!" Commander: "A slice of lemon on the bread plate reminds us of their bitter fate, captured and missing in a foreign land. The salt sprinkled on the plate is to remind us of the countless tears of those who have never come home and of the fallen tears of their families and friends, whose grief knows no end." Commander: "The single red rose, displayed in the vase, signifies the blood they may have shed in sacrifice to ensure the freedom of our beloved United States of America. This rose also reminds us of the family and friends of our missing comrades who keep the faith, while awaiting their return." Commander: "The red ribbon, tightly tied on the vase, represents the red ribbons worn on the lapels of the thousands who demand with unyielding determination a proper accounting of our comrades who are not among us tonight." Commander: "The candle is the light of hope which lives in our hearts to illuminate their way home, away from their captors, to the open arms of a grateful nation." Commander: "The glass is inverted, for they can not toast with us tonight." Commander: "The Bible represents the strength gained through faith to sustain those lost from our country, founded as one nation under God." Commander: "The American Flag reminds us that many of them may never return - and have paid the supreme sacrifice to ensure our freedom." Commander: "The chair is empty! They are not here." Commander: "We all called them our comrades, brothers, sisters, and friends. Do not let them be forgotten, for surely they have not forgotten us. Chaplain: "We will pause for a moment of silence in honor of our Prisoners Of War, our Missing In Action, and our Killed In Action." Chaplain: "Let us remember and never forget their sacrifices. May God forever watch over them and protect them and their families. Let us pray that our comrades will soon be back within our ranks. Through Christ our Lord. Amen." Commander: "Remember! -- Until the day they come home, Always remember!"